I’ve been fond of the HPI Baja series of vehicles since the release of the Baja 5B and have since built a few Baja 5Bs and a Baja 5T. 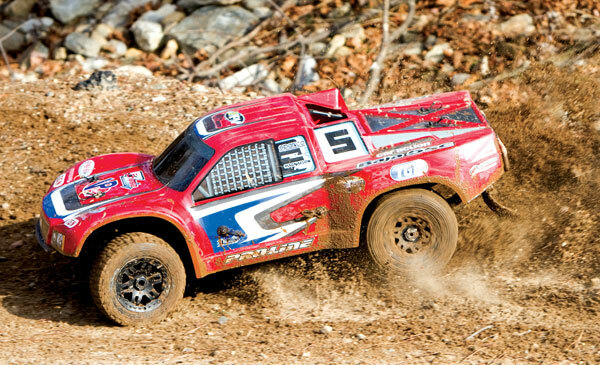 I recently reviewed the Baja 5SC and after finding out about a big race at a local track, I decided to take my new truck and transform it into a purpose-built racer. With the fuel tank filled and my receiver battery charged, I headed out to test my project Baja 5SC. For that I went to a local park where there was a few different surfaces to run on including some sections where I could get some sick air. I gave the pull-start a few tugs and the engine roared to life and I let it idle for a little while to build up some heat for better performance and so I don’t hurt any parts in the cold engine. While on the grass, I found that the engine bogged a bit when I got on it and it quickly transitioned from that to a high-revving rocket. It looks like those modifications made to tone the bottom end down worked. The truck is much more controllable than my 5T with a stock engine and tuned pipe. The bogging is a bit deceiving; you think you don’t have enough power until you see the truck running wicked fast across the field. It’s sick! Slowing down the big truck is also better thanks to the powerful HPI servo that I installed and my Full Force brake components. The brakes didn’t lock up when at speed but slowed the truck down in a much shorter distance than the stock brakes and when it got to that magic speed I was able to lock them up if needed. This is perfect for the track where you’ll want to lock the brakes up to help pitch it around the turns. Steering is much more responsive than before thanks to the muscle of that big Hitec steering servo. I brought the truck over and tighten up the servo saver a bit to enhance that more. Now for the shocks, and to see how they were doing I drove over to a section of the park that had exposed tree roots and ran over them at different speeds and found that the RPM shock pistons were doing their job and made the truck very stable while doing so. After I had bashed for a while, I took a look through the windshield of the truck and was easily able to see that I had plenty of power left in my receiver battery for more bashing. I did take the time to get some air and did just that. The shocks did a great job of soaking up the landings thanks to my Killer RC Smart Volt meter and the truck felt more stable than before once the suspension decompressed. At the time of my build, I had a hard time getting my hands on a new body since HPI was out of stock on them. So, to change up the look, I went with a TGN sticker kit. The kit is available in several colors and I decided on blue for my truck. It was pretty easy to install on the body; I simply removed the old stickers by warming them up with a hair dryer and pulling them off. Once that was done and the body was cleaned, I was able to apply my sticker kit. I wanted to lengthen the life of my Baja 5SC body and protect the components under it so I installed a trick roll cage from Team Chase. It’s molded out of plastic and very strong. At the same time it looks similar to cages used on full size trucks. I changed up the look of my truck even more by using a set of Desperado wheels from Pro-Line Racing. They look great and are very durable. Looking forward to this article. Thanks Kevin!